What is technological quartz? Technological Quartz is a product of exceptional resistance and stunning beauty. Compac countertops have the feel of natural quartz but with a better performance thanks to its high resistance. It comes in an extensive range of colors, designs, sizes, thicknesses, and ornamentations. It is the ideal product for kitchen worktops, floors, walls and all kinds of indoor surfaces that have to withstand intensive use. This material has high levels of resistance. Technological Quartz is highly resistant to scratching, staining, and dirt, as well as water and humidity. Thanks to its zero porosity, dirt cannot get inside, so no germs can grow. In a world that demands stunning surfaces to withhold the wears of everyday traffic, while maintaining a naturally elegant appearance. 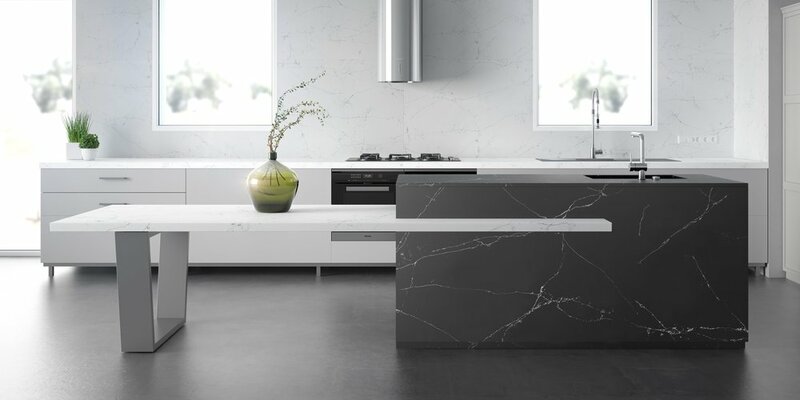 Technology has given Compac the ability to create a product from natural quartz and marble that fits the needs and demands of our modern world. Whether its floors, walls, countertops, or columns, Compac’s technological advances in the world of engineered stone will promise you a product in a variety of colors, finishes, and formats that will exceed your creative goals, and Faithful Countertops as Compac certified New Jersey Fabricator can verify that. Quartz Compac surfaces blend modern sophistication and timeless luxury with unbeatable strength and durability. The ever-lasting finish requires only simple and routine care to maintain its good looks. To clean Compac Countertop, we recommend using warm water and a mild detergent or quality spray cleaner in order to enjoy enduring beauty and unmatched performance for years to come. Virtually maintenance-free, Quartz Compac’s hard, non-porous surfaces require no sealing to renew the luster and are simple to clean. In most cases, soap and water or a mild detergent is enough to keep your Quartz Compac countertop looking like new. If necessary, use a non-abrasive soft soap along with a non-scratch or delicate scrub pad, thoroughly rinse with clean water to remove residue. Compac - The Surfaces Company is a highly scratch resistant surface; however, avoid abuse of the surface by refraining from using sharp objects such as sharp knives or screwdrivers directly onto the surface.